Does it really speak to who I am and my personal style? I may feel attracted to something, maybe because it’s super on trend (let’s face it, we’re wired to like something when we see it over and over again…it’s human nature and why advertisers bombard us daily), or it’s just really pretty, but I have to be realistic and ponder if it’s really me. This is where having a clear idea of your personal style comes in handy. If your sense of personal style is strong, this question becomes easier to answer. Is it made well and/or has something unique about it? I try to keep my tailoring overhauls to items that are starting off well made, of quality fabric, and that have a detail that makes them special to me (sometimes it’s as simple as having a chest pocket on a coat or blazer when the other options I’m mulling don’t). Have I had fast fashion items completely overhauled? Yes I have. But both were after great care and consideration about the style, details, and even fabric. I try to choose the item that best closely resembles what I’m going for in terms of fabric, silhouette, details, and price. 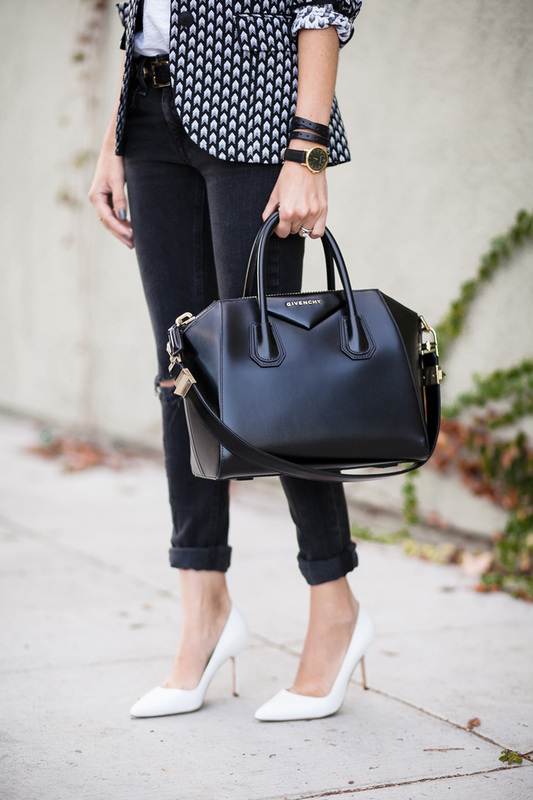 Can I incorporate this trend into my closet in a way that makes it classic? That’s what I did with this blazer. The trend it was swimming in was the summer of the “print blazer” a few years ago. I liked the trend, but couldn’t find an item I liked that also fit. Instead, I found this black and white chevron print in a very classic and menswear silhouette that I loved. By keeping the silhouette in line with my personal style (Blazer, check. Menswear inspired, check), the color palette neutral, and the print basic, I figured out a way to incorporate the trend into my closet while still keeping it classic. For me, tailoring also carried of a risk factor of “will the tailor do a good job?” I’m in a city where tailors are uncommon, and I’ve just been so disappointed by the last two places: A pants I had hemmed now has one leg shorter than the other! and a leather jacket with shortened sleeves is uneven and has excess lining. I have beautiful pieces that have gone unworn, a plaid dress that is too large but I want the pattern to line up again, a slightly too long wool coat, silk shirts with ridiculously long sleeves, because I can’t bear to have them poorly done. To get something tailored I have to love it enough to put in the extra money, but then it means I’m also extremely disappointed when it’s ruined! Thanks KR! Ahh…yes…the good ol’ tailor f-up. I am also very familiar. Excellent point, and reminds me that this post is more helpful when you already have a tailor you trust (which is a tough feat in itself). But even then I’ve had the most excellent tailor I’ve ever worked with completely ruin a few things. It’s heartbreaking! And hurts the wallet! Thanks for bringing this up! The printed jacket is classy yet super chic at the same time in my opinion! Definitely worth tailoring for better fit since its monochrome colors guarantee that it will be a timeless design to keep. Thanks for sharing your tips on whether an investment is worthwhile when it comes to tailoring a piece, these ideas will come in handy for sure! Such a great look! 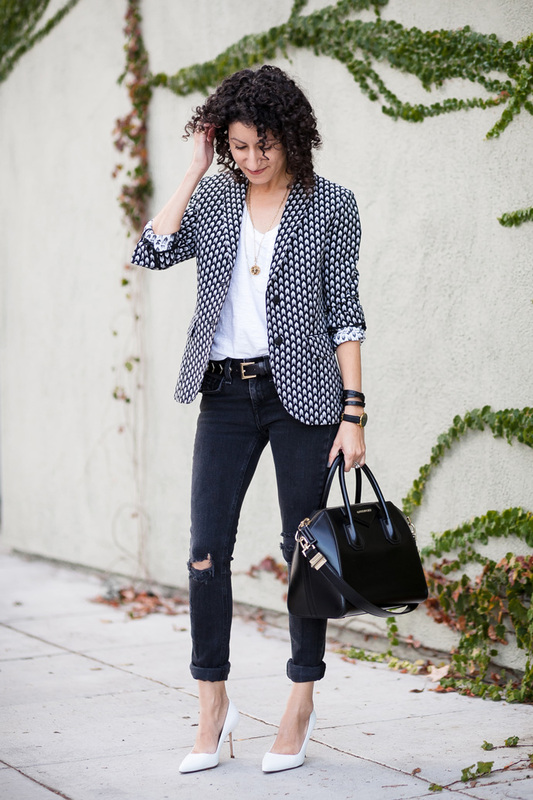 Love the blazer!